Like any server migration, a virtual server migration requires careful planning to ensure success. You'll find information here on the specifics of migrating from vSphere to Hyper-V, planning for down time, IP address differences, performance considerations, and more. For migrations to Hyper-V, SCVMM is once again the preferred tool, but you'll also be introduced to some of the excellent free tools available. One easily overlooked aspect of the migration process is the way in which it impacts your backup and recovery strategy. Knowing the best practices here can help you protect your Hyper-V environment. 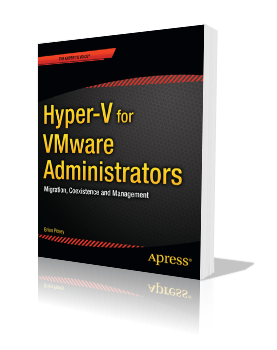 The book also covers how to monitor and maintain your Hyper-V environment once it's up and running, using features like Cluster-Aware Updating, automated live migrations, and availability sets. The concluding chapter shows you how to take advantage of the efficiencies provided by virtual machine libraries and templates. Approach Hyper-V with confidence, and the knowledge that you've planned for success, with Hyper-V for VMware Administrators. Find out how Hyper-V compares to VMware's vSphere, and how System Center Virtual Machine Manager compares to vCenter. Prevent Hyper-V from becoming a single point of failure with failover clustering. Work with System Center Virtual Machine Manager to manage both Hyper-V and vSphere environments through a single interface. Plan and execute a virtual server migration, including planning for downtime, IP address changes and performance considerations. Adapt your backup and recovery strategy for best results in your new Hyper-V environment. Monitor and maintain your Hyper-V clusters, using Cluster-Aware Updating, automated live migrations, and availability sets. Use virtual machine libraries and templates for increased efficiency. Readers should have a working knowledge of vSphere 5.5. No prior experience with Hyper-V is expected.